Construction going on next door and a wood building. Sorry for the long over due photo. I missed receiving the threads of the discussion and forgot about it. Frank, we must have met back then. I was an instructor at Skippers from late ’69 until the summer of ’71 when I got out of the Navy and returned to the New York area. Those were exciting days exploring coastal dive spots and inland springs – plus all those spectacular trips. My favorite was to Glover’s Reef off Belize (then British Honduras). Thanks for setting up this blog – hope you keep it up and maybe some more old timers like me will discover it. I received my dive certification from Joe Kingry in 1968 in this building. It was a very tough course, very long pool, and one had to be a good swimmer to become certified. Thanks Frank for tackling this photo project. I took my sons to the studio across from Sacred Heart many times in the 60’s and 70’s. Frank was a great photographer. 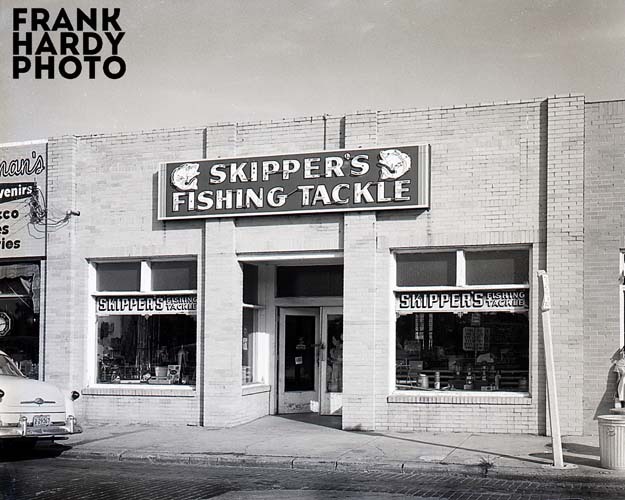 My Dad, Joe Kingry, bought half of Skippers from Mr. Skipper senior around 1958 when he introduced scuba diving along with the fishing tackle. He was in partnership for a while with his son, Ben Skipper. Eventually, Ben sold his half to Glen McDonald. The two of them expanded the dive training program,adding the dive instruction pool out back, and became one of the top 10 dive shops in the country for many years with the help of alot of very good dive instructors, according to the major dive equipment manufactures of the time. They remained partners until sometime in the late 70s. Glen branched off in the commercial diving side of the partnership and in fact was the hero that saved the passengers of the National flight “Dona” that landed in Pensacola Bay. Dad sold the business in the mid 80s but rented the building to the new owners until almost 1990. He spent 32 years doing what most people just dream of doing in this little building in the picture. I recall a photo store was next door to the tackle shop at some point. Brings back lots of GOOD memories. Oh too be 30 again……………the fun I would have……. I can say I knew your dad since I graduated from one of his scuba classes in May 1965 as a snotty nosed kid (sailor). I think about that place from time to time and always had great memories of Joe and the dive shop, diving has come along way since those days and sometimes I wonder how we ever managed to stay alive doing things we would never think of doing now! It’s been 48 years and a month since I certified and I am still active as a diver I manage to get in several dives each month if I need it or not? I have a photo of the store from the 1930s. Brick streets then. I never knew my grandfather, as I was born after he died. It was originally a tackle shop. I have vague memories of going into the store. My father Ben F. Skipper, Jr. never talked much about the shop. I knew Glen MacDonald bought into the store, but was unaware that my father sold his share in the store to him. I never knew my dad had a share. I do know that my grandparents made my dad work in the store instead of going to college and then sold it. I do remember there was a barber shop on the block where I got my crewcut until I was old enough to say no more crewcuts. I also remember the diner at the end of the corner. There was a photo shop to the right of the tackle shop. Hello–the restaurant on the corner with the “Pensacola Lunchroom” and was owned by Mr. Mike Callas. Joe Kingry had a brother, Carl Kingry who had a son John. We were best friends. Carl would take us to the shop and Joe Kingry would let swim in the pool. Carl and John were in a fatal wreck one summer–1965-1966? I remember his mom, Eloise–last I heard she remarried and moved to Orange Beach??. I too got my Scuba card from Skipper’s. John also had a sister–Gail/Gale??. I don’t know what became of her. Nick … I can remember a restaurant there on the corner back in the 1970’s that I used to go and eat in, but I could not recall it’s name. I did not know the owner personally, but he was a friend of my father’s. As far as the Kingry family goes, all I really knew was the father, Joe. He was also nice to us and we spent a lot of time down at the business back around 1969, 70 and 71. I never knew that he had a brother and I am sorry to hear what happened to him and his son. Thanks for commenting and keep in touch … it was nice hearing from you. folks this is 406 E Wright St, Still there, now Emerald City Dance Bar. There was an indoor pool in back, probally not when it was a tackle shop but when it was a dive and swimming lesson place. The pool is now filled in.